The annual MOBO awards took place in Glasgow on Wednesday evening. Jessie J was the big winner on the night taking home four awards for Best UK Act, Best Newcomer, Best Song for 'Do It Like A Dude' & Best Album. She stood out in the style stakes too showcasing three different outfits during the evening. She opted for a gothic look on the red carpet in this lacy Julien Macdonald gown with sheer panels. She accessorised with her trademark gold bling. The vampish look was complete with bright red lips and side swept hair. Dionne Bromfield looked stunning in this chic black dress with a long flowing train and a gold embellished belt. She performed 'Love Is A Loosing Game' during the ceremony in tribute to her late godmother Amy Winehouse. Singer Yasmin stood out on the red carpet in this plunging animal print monochrome gown by Odabash Macdonald. 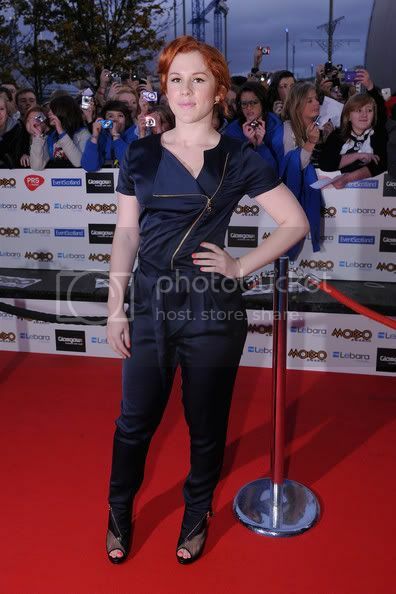 Katy B showed how to look glamorous in a jumpsuit in this midnight blue satin jumpsuit with a tie front and gold zip detailing, paired with black and gold heels. Alexis Jordan showed off her figure in a bodycon LBD with gold detailing and fringing. She completed her outfit with classic black peep toe heels. Did you watch the MOBO's? Which was your favourite outfit from the night? I did not watch this, but the dresses look really pretty. These ladies are gorgeous! Wow what gorgeous dresses absolutely love them all :) makes me want to get all glammed up ha-ha! Great selection! Dione bromfield looks lovely. Not a fan on alexis jordans dress though. I didn't watch it but I love Dionne Bromfield's dress! oh my gosh... I love all these looks! probably because I love anything dark and vampy, nonetheless, they're all gorge!